Probabilistic forecasting makes predictions in settings where even perfect prior knowledge does not allow for impeccable forecast and provides appropriate measures of the uncertainty that is associated with them. In a supervised context, probabilistic prediction problems have been tackled through various strategies in both the frequentist and the Bayesian domain. Today, a variety of learning algorithms are available that make predictions in form of probability distributions. However, it is hard to compare different prediction strategies of the different toolboxes in a fair and transparent workflow. 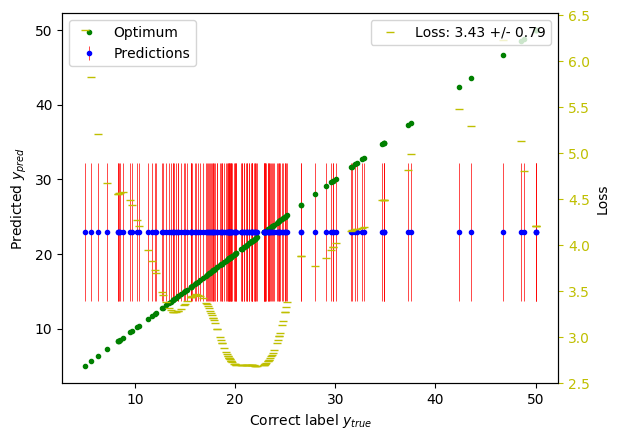 skpro is a supervised machine learning framework that allows for probabilistic forecasting within a unified interface with the goal to make model assessment and comparison fair, domain-agnostic and approachable. It is based on the well-known scikit-learn library and provides integrations for popular prediction toolboxes such as PyMC3. The package is being developed open source under the direction of Dr Franz Király and has been released under a BSD license. We are currently in public beta. Let’s have a look at an example of Boston Housing price prediction (using sklearn’s boston data). If you are familiar with scikit-learn you will recognise that we define and train a model on the boston housing dataset and obtain the test prediction y_pred. Furthermore, we use a loss function to calculate the loss between the predicted points and the true values – nothing unexpected there. You can see that the employed baseline model predicted a constant distribution for each data point (specifically, it used the mean and the standard deviation of the training labels); the losses of each prediction point vary accordingly. The skpro predictions are hence forecasts of a genuine probabilistic kind that are a primary interest for many real-world applications. Notable, this can include Bayesian as well as frequentist models using the same unified and convenient interface. Obviously, we ought to compare multiple models for gain meaningful insight into their performances. For this reason, skpro supports simplified and standardized prediction workflows for model assessment and comparison. The table below represents an example of a sorted result tables that can be easily generated by the workflow framework: Models are listed in the rows of the table while the columns present the cross-validated performance of a certain dataset and loss function. The numbers before the loss denote the model’s performance rank in the respective column. The models are sorted by the average model rank, displaying models with the best performances (that is the lowest losses) on top of the table. The resulting table compares the composite prediction strategy against the baseline model and suggest that the model outperforms the baseline. In sum, skpro thus allows for reliable, fair and best-practice model assessment with minimal development overhead for the user while being agnostic of the domain and vendor of your models. Do you like what you see? Read the installation instructions or continue to the comprehensive user guide to learn more.